Week 2 of the NBA Panic Mode column takes us to the loneliest city in professional sports, Oklahoma City. If the 2016-17 Chicago Bulls were the benefactors of the magic of TNT, the NBA’s biggest regular season stage, then the magic had run its course by last Thursday. The first of TNT’s double header between the Boston Celtics and Oklahoma City Thunder was a verified brick fest through the first half. The Bulls would show up and show out when the United Center was featured on Turner Sports’ weekly broadcasts, posting 20 straight victories at home and amassing all manner of puns and memes along the way. Oklahoma City almost harnessed that Bulls-ian energy. The Thunder’s 11-2 run to start the game took advantage of Boston’s recent offensive struggles. But for a team that entered the night 0-3, the electrified Oklahoma crowd and early Celtics misfortune provided a false sense of security that made Boston’s eventual comeback win sting so much more. After the loss, Russell Westbrook had the quintessential, “I’m the team leader” statement. Westbrook hit all the right notes. He took the blame for an abysmal second half. Some of the blame fell on him, for sure. He missed all seven shots he took and dropped three turnovers in the last quarter. For a game that ended as a six-point loss, logic might suggest that a few more made buckets and fewer turnovers could have closed the gap. But it’s not entirely Westbrook’s fault that it took Patrick Patterson and Alex Abrines until the fourth to contribute offensively. 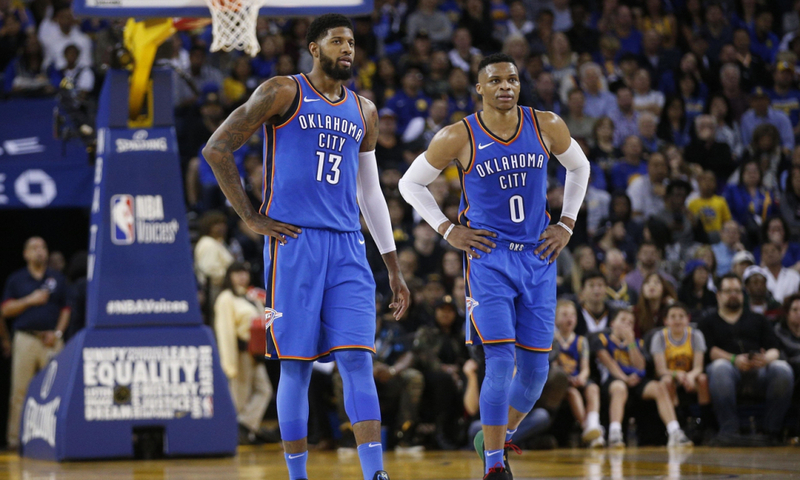 Westbrook can’t be blamed for Sam Presti, architect of the 2017 fleecing of the Indiana Pacers for Paul George, failing to find a free agent shooter this summer, instead settling for Nerlens Noel and Dennis Schroder. Oh, and you can’t tell me that a Patterson one-on-one in the fourth quarter is ever the play you want to run. Especially not as all four of his teammates look on with equal parts wonder and apathy. Don’t get me wrong, Westbrook’s basketball quirk is playing at one speed: fast. But since Kevin Durant’s departure in 2016 he hasn’t had a team around him to facilitate his speed and intensity beyond providing him the occasional targets to help rack up triple-doubles. OKC is in a rut. The underdog, “we’ll be fine without KD” energy it exuded for the last two seasons is drained. The reality of a playoff push is as distant as ever, as the competitive west streamlines what it means to be successful. The Portland Trail Blazers have struck gold with Nik Stauskas. The New Orleans Pelicans are rounding out Anthony Davis’ supporting cast with bruiser Julius Randle and sharpshooter Nikola Mirotic. Teams are trying to close the gap on the Golden State Warriors while the Thunder are forced to twirl its thumbs. With its core—Westbrook, Steven Adams and George—locked up with the team through 2021 at least, the Thunder need to devise a plan for future success. Success that’s probably coming later, rather than sooner. Deciding whether to love Westbrook for his passion of play or to crucify him for is line drive approach to basketball is a nightly internal conversation. Look, Westbrook gave us NBA history, two years in a row. I can tell my eventual grandchildren about the time I sat in front of a Samsung television—the official television of the NBA, mind you—and watched a packed arena in Oklahoma applaud a guy who willed himself into the record books. And that’s just it. For as amazing and athletic and energetic Westbrook is, he can’t will his team to produce better than it can. It’s actually surprising that Westbrook can amass the stat lines he does, considering that apart from Adams and George he lacks a guaranteed target who can finish his passes. But what’s a small market team to do. Presti lucked out that George valued OKC over his hometown at this point of his career. Beyond his re-signing, Oklahoma’s biggest news this summer followed the team’s plans to rid itself of Carmelo Anthony’s decision to opt-in. The Thunder eventually traded Anthony and his $28 million deal to the Atlanta Hawks, but not before picking up Noel on the second day of free agency this summer. I know the Thunder were in a precarious salary position with or without Anthony, but what does it say about an organization that decides to add Noel without having a full grasp of what holes will need filling upon Anthony’s departure? It’s more than likely that Noel would still be on the market after the Anthony deal went down on July 20. What was the rush? That example is not to put the blame of OKC’s current struggles on Noel, rather it’s to illustrate the directionless trajectory the Thunder have had since adding George. As the team’s second star, George was supposed to complement Westbrook in the same way, well, Durant complemented Westbrook. But where the 2015-16 Thunder had a couple of effective role players to support their stars and their 55-win season (Serge Ibaka, Enes Kanter) today’s team is stuck as a subpar playoff team, maybe good enough to slip into the eighth seed and flame out to a real title contender. Without cap space or trade assets, what are the Thunder to do? Early signs of tanking as an option seem viable, until you realize that the Thunder could never throw games within earshot of Westbrook. Plus, look at the Memphis Grizzlies. How difficult will it be to bounce back to playoff greatness after a 22-win season in 2017-18? It’s only four games into the Thunder’s season, but the outlook is already bleak. A compromised defense without Anthony Roberson and a stagnated offense doesn’t add up to another playoff appearance, nor does tanking while retaining Westbrook and George. Far from a free agent destination, the Thunder are sandwiched between two paths to mediocrity. Already a small-town team weighed down by the pressures of the big stage, panic in OKC might be around the corner.